Easy Dinner: Barbecued Pork Loin, Weekly Menu Plan. There will be enough leftover for a picnic - and the dinner could be cooked ahead and served cold for an easy day. This is the 'classic' or original (close to it, anyway) Pasta Salad. The original called for bottled "Italian Dressing" but I prefer to make my own. It's a great salad to take to a pot-luck picnic or to plan on leftovers. For two I would simply cut everything in half. Cut salami in half or into quarters. Peel and quarter the onion, then slice thinly. Cut olives in halves or thirds. 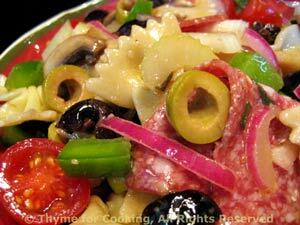 Put salami, mushrooms, onions and olives into bowl and add vinaigrette. 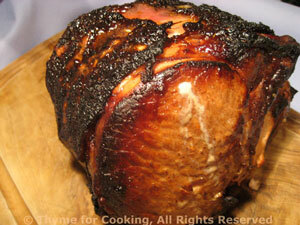 Allow to marinate, at room temperature, for 1 - 3 hours. When done, drain, put into a large bowl (or back into the cooled pot) and toss with olive oil. Slice celery 1/4" (.5cm) thick, cut cherry tomatoes in half, and chop pepper. Add all three to pasta and toss lightly. Before serving add marinated vegetables to pasta and toss to combine. If not serving immediately, refrigerate to chill. Place mustard, vinegar and lemon juice in a small bowl and whisk to combine. Slow add olive oil, whisking constantly, to combine. When all oil is in and emulsified, add herbs. American Pork and Beans with a Spanish twist. 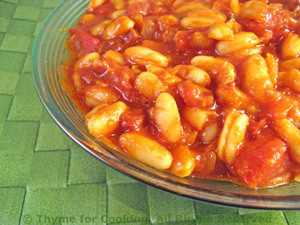 Beans (alubias) of all types are a staple in Spain. This serves 4 or is enough for 2 meals for 2. Drain beans and rinse well. In nonstick skillet sauté bacon over medium heat. When done remove, drain and crumble. Remove fat from skillet. Add olive oil, onions, garlic, paprika and sauté until onions are tender. Add tomatoes, tomato past, stock, beans and bay leaf. Simmer, uncovered for 15 minutes. Add crumbled bacon, remove bay leaf and serve. To peel tomatoes: Bring a medium pan 3/4's full of water to a boil on high heat. Drop tomatoes in for 30 seconds - start timing immediately. Remove tomatoes and drop into a bowl of cold water. Remove and peel with a knife or your fingers - peel will come off very easily.